Chinese calligraphy, like Chinese characters, first appeared during the Shang or Yin Dynasty. The initial stage lasted until the end of the Han Dynasty and the beginning of the Three Kingdoms Period.Characters gradually developed，beginning with the oracle bone script during the Shang or Yin Dynasty and ending with the running script and the standard script during the Han Dynasty. During this long period, some other scripts came into being, including the bronze script, the large seal script, the small seal script, the clerical script and the grass script. Calligraphy is an art dating back to the earliest day of history, and widely practiced throughout China to this day. Although it uses Chinese characters as its vehicle of expression，one does not have to know Chinese language to appreciate its beauty. Because in essence, Calligraphy is an abstract art. Brush pens have been used to practise and improve people's handwriting for thousands of years. It has become a tradition arts and crafts production in China. Chinese calligraphy stresses the overall layout among words and lines. Beside the dense and sparse, proportional arrangement of the strokes of the words, a piece of calligraphy must have an overall harmoniousness that is not lack of changes. Especially the calligraphy of the cursive script and the running script often increases the interconnection between the words and the continuity of the momentum in order to achieve a music like rhythm. Beside the brush, ink and paper are also instruments of calligraphy. Together they produce varied effects. Calligraphists often pay much attention to the methods for the use of ink, which include the use of thick ink, light ink, dry ink, missing ink, wet ink, withered ink, swelling ink, etc. The “four treasures of the study”— writing brush, ink stick, ink slab and paper — are writing tools with a long cultural tradition and unique artistic style created by the ancestors of the Chinese nation. They have played an important role in recording Chinese history, popularizing various cultures, and promoting the development of Chinese calligraphic and pointing art over thousands of years. The writing brush has a long history in China. In the beginning, people wrote with bamboo sticks on bamboo slips. Around the time of the Warring States Period 2,200 years ago the ancient Chinese began to tie rabbit hair to bamboo sticks to make the first writing brushes. The brushes of the early period were crude and simple, while later ones made of a mixture of deer hair and wool are characterized by the correct stiffness and good workmanship. The pine soot ink stick is made of especially fine pine soot. After rinsing and sieving, the pine soot is mixed with cowhide glue, borneol and precious Chinese medicinal spices. The ink of such ink stick is dark and not lustrous, suitable for repairing old paintings and calligraphical works. The colored ink sticks include red, yellow, blue, white and green ink sticks. Beside being used for coloring of the traditional Chinese painting, it is also used for other graphics. Writing paper for Chinese painting and calligraphy was produced in Jing County, Anhui Province. During the Tang Dynasty, Jing County was under the official administration of Xuanzhou Prefecture. Jing paper had to be transported to Xuanzhou before it was distributed elsewhere. So this paper was named xuan paper. It absorbs ink well and shows clearly the lines and strokes. It has great tensile strength, and it retains its quality a long time. Artists prefer using xuan paper mainly because their paintings and calligraphy can last many years. The ink slab is indispensable for Chinese calligraphy. It originated very early. Most ancient ink slabs unearthed by archaeologists were made in the Western Han Dynasty, when their forms were basically established. 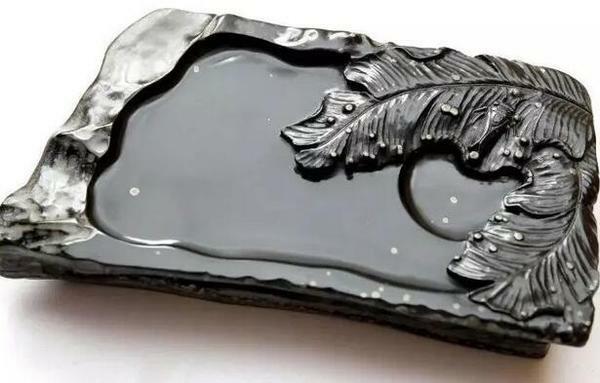 The ink slab is also called ink stone or ink tile, and is a Special Chinese cultural instrument, known as one of the “four treasures in a study”. It was considered by ancient Chinese as the first treasure of the four treasures.